Handcrafted Mini Jewelry Box with Floral Motif, "Floral Array"
Floral motifs swirl gracefully along the sides and lid of this lovely decorative box. Artisan Gung Gus of Indonesia meticulously hand-paints the crocodile wood box, lining it with black velvet. 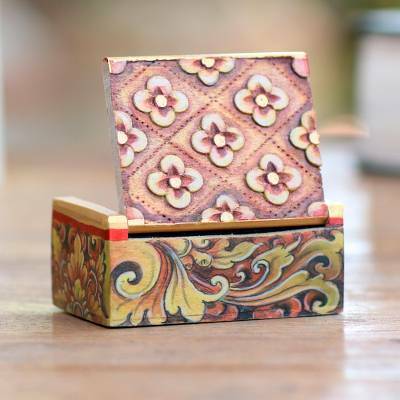 You can find wood mini jewelry box 'Floral Array' by Gung Gus in jewelry boxes categories such as Hand Painted Boxes and Wood Boxes. Enjoy exploring these sections for other Novica treasures.